I’ve heard it said that integrity is best defined as who you are when no one’s looking. When there’s no one around to impress, no facade to keep up, who are you then? The sixth episode of Daredevil, however, presents a very different kind of ethos. It suggests that character or integrity is suggested not by what you do when no one’s looking, but what you do in when everyone hates you. At least, that’s what the show is building up to. Fisk has already spread the rumor that it was the man in black who killed Vladimir’s brother, and blowing up the Russian’s remaining territory puts an even bigger bullseye (heh. Bullseye.) on the vigilante’s back. But it’s not just that fact that adds an extra level of tension to the story in this episode – it’s Foggy and Karen watching TV, discovering that the masked vigilante, who they don’t know is their dearest friend, is something of a domestic terrorist. And in the midst of all of this, with false accusations of terror, murder, and arson on his back, Matt Murdock must save the life one of the city’s most dangerous criminals. That’s the central focus of the episode – Matt trying to save Vladimir, and the struggle between the two men’s wills in an old abandoned warehouse. It’s their exchanges that mark the episode’s thematic exposition, an exploration of ideology and fate. Daredevil’s no-kill ethic (a curious deviation from the series’ inspiration, by the way) is challenged by Vladimir, who insists that killing is inevitable in his line of business. Up to this point, Murdock is in control. His skills have enabled him to stay one step ahead, and his faith keeps him from taking that final step and taking a life that does not belong to him. He’s to be commended for that. But then, he loses control. Not because of someone with superior skills, or even because of the sheer number of police that are looking for him, but rather because of a conversation. A conversation with Wilson Fisk. 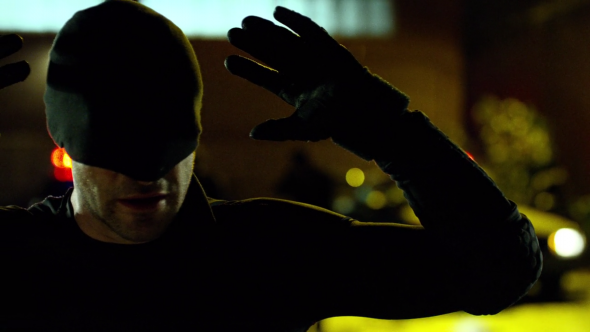 When Fisk finally does get in contact with Daredevil, the conversation they have is a total game-changer for the tone of the series. There’s not anything remarkable that happens, except that in a very well-written scene, Fisk establishes a sense of power over Murdock with a patronizing tone that, better than any other scene in the series, shows us a larger than life, truly villainous, Kingpin. This episode is the best yet in the series, not just because of the action or the stakes, but because of the character development between the vigilante and villain. It’s setting us up for that ultimate question, and the ultimate decision – will Daredevil choose to end Fisk’s life? And if so, how can he reconcile that with his faith?